Dams have been a politically contentious issue in China since the 1950s, during which Mao’s effort to rapidly industrialize China resulted in the emergence of thousands of poorly constructed dams across the country, all of which had collapsed by 1980 . The Three Gorges Dam Project (which began in the early 1990s) has entailed similarly disastrous ecological, social, cultural and humanitarian consequences. By 2003, the dam had flooded two cities, 11 county towns, 114 townships, and numerous villages and farms . By the time the project was completed in 2009, 13 cities, 140 towns and 1352 villages [were] under water . The large-scale inundation of human settlements associated with the Three Gorges Dam project has in turn resulted in the forced resettlement of “at least 1.2 million” people” (ibid), many of whom never received adequate compensation for their economic, social and cultural losses. While there were many who opposed the central government’s plans to approve the dam project in 1992, only a few activists (such as prominent journalist Dai Qing) dared to publically vocalize their criticisms. At the time there were no environmental NGOs in China, and public opposition [to the dam project] was nearly impossible...[since] opponents [would simply be] identified as dissidents . 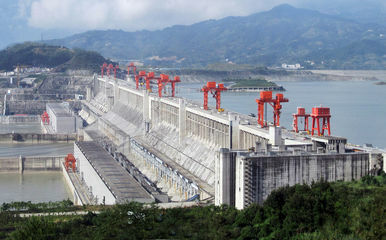 Fully functional as of July 4, 2012, the Three Gorges Dam is currently the world’s largest hydropower project and most notorious dam. The project has been plagued by corruption, spiraling costs, environmental impacts, human rights violations and resettlement difficulties . According to the China Three Gorges Project Corporation, funding sources include the Three Gorges Dam Construction Fund, profits from the Gezhouba Dam, loans from the China Development Bank, loans from domestic and foreign commercial banks, corporate bonds, and revenue before and after the dam is fully operational. Additional charges were assessed as follows: every province receiving power from the Three Gorges Dam has to pay ¥7.00 per MWh extra. Other provinces had to pay an additional charge of ¥4.00 per MWh. Tibet pays no surcharge. The environmental impacts of the project are profound, and are likely to get worse as time goes on. The submergence of hundreds of factories, mines and waste dumps, and the presence of massive industrial centers upstream are creating a festering bog of effluent, silt, industrial pollutants and rubbish in the reservoir. Erosion of the reservoir and downstream riverbanks is causing landslides, and threatening one of the world’s biggest fisheries in the East China Sea. The weight of the reservoir's water also has many scientists concerned over reservoir-induced seismicity. Critics have also argued that the project may have exacerbated recent droughts by withholding critical water supply to downstream users and ecoystems, and through the creation of a microclimate by its giant reservoir (ibid). In May 2011, China’s State Council – the highest state organ – admitted in a statement that “while the Three Gorges Dam has brought great benefits, there are still urgent issues with relocations, environmental protection and the prevention of geological disasters; and it has had a certain impact on navigation, irrigation and water supplies" . When a landslip destroyed the Lifengyuan Hydropower Station in Hubei province's Zigui county in September 2014, it was the first time the Three Gorges region had seen one of its electricity-generating dams wiped out. But the collapse forms part of a growing nationwide trend as dam reservoirs and construction destabilise the terrain around China’s hydropower stations . The Three Gorges Dam has created a giant 600-kilometre reservoir, the water level and expanse of which change throughout the year, and this has two worrying consequences, said Yang. First, the banks of the reservoir are subjected to frequent changes, increasing the chances of landslides. Second, the huge lake influences the local climate, making extreme weather events — particularly cloudbursts and heavy rain — more likely. Add in disturbances from construction for relocation of residents (1.13 million were moved for the Three Gorges dam project), road-building and quarrying of stone and earth for hydropower projects and, he believes, all the conditions for geological disaster exist (ibid). The Three Gorges region has already become disaster-prone, according to Fan Xiao, chief engineer to the Regional Geological Survey Team of Sichuan province's Geology and Mineral Bureau. He told chinadialogue that over 5,000 danger points — collapses, landslides, dangerous cliffs and banks — have been identified (ibid). A long series of international companies and consortia have had and are still having stakes in the project; Probe International tracked them and included for example Acres International, a Toronto-based engineering consulting firm, one of five companies and utilities that formed a consortium, Canadian International Project Managers Yangtze Joint Venture (CYJV), to conduct a $14-million feasibility study for China’s Ministry of Water Resources and Electric Power, which gave the green light to the Three Gorges dam. The consortium GE Canada-Siemens-Voith Hydro consortium supplies turbine-generator units, while Hydro-Québec International (a wholly owned subsidiary of Hydro-Québec) signed a $2.85-million (US$1.9 million) contract in June 1999 with China Power Grid Development Company to supervise installation of a 900-kilometre transmission line from the Three Gorges dam to Changzhou, 80 kilometres northwest of Shanghai. Many foreign finance instiotutions and banks provided loans for their companies. The full list is available at the Probe International webiste . Why? Explain briefly. In an unexpected statement, China’s government has just acknowledged the serious problems of the Three Gorges Dam. “The project is now greatly benefiting the society in the aspects of flood prevention, power generation, river transportation and water resource utilization,” the government maintained, but it has also “caused some urgent problems in terms of environmental protection, the prevention of geological hazards and the welfare of the relocated communities" . Jackson, S. & Sleigh, A. (2000). Resettlement for China’s Three Gorges Dam: socio-economic impact and institutional tensions. Communist and Post-Communist Studies, 33(2), 223-241. Shapiro, J. (2012). China’s environmental challenges. Cambridge, U.K., Cambridgeshire: Polity Press. Jing, J. (1997). Rural resettlement: Past lessons for the three Gorges Project. The China Journal, (38), 65. Lin, T.C. (2007). Environmental NGOs and the Anti-dam movements in China: A social movement with Chinese characteristics. Issues & Studies, 43(4), 149-184. Is the Three Gorges Dam a Ticking Time Bomb?